1. Floor and Ceiling Runners — For Nonbearing Walls — Channel shaped, min. 3-5/8 in. wide with min 1-1/8 in. flanges, fabricated from min No. 20 MSG galv steel. Attached to floor and ceiling with fasteners spaced 24 in. OC. 1A. Floor and Ceiling Runners — For Bearing Walls — Channel shaped, min. 3-1/2 in. wide with 1-1/4 in. flanges, fabricated from No. 20 MSG (0.0329 in., min bare steel thickness) corrosion resistant steel. Attached to floor and ceiling with fasteners spaced 24 in. OC. 2. Steel Studs — For Nonbearing Walls — C-shaped, fabricated from min No. 20 MSG galv steel, min 3-5/8 in. wide with min 1-5/8 in. legs and min 5/16 in. stiffening flanges, spaced 16 in. OC. Studs cut 3/4 in. less than assembly height. 2A. Steel Studs — For Bearing Walls — C-shaped, min. 3-1/2 deep, fabricated from No. 20 MSG (0.0329 in., min bare steel thickness) corrosion resistant steel. Studs shall be designed in accordance with the current edition of the Specification for the Design of Cold-Formed Steel Structural Members by the American Iron and Steel Institute. All design details enhancing the structural integrity of the wall assembly, including the axial design load of the studs, shall be as specified by the steel stud designer and/or producer and shall meet the requirements of all applicable local code agencies. The max stud spacing shall not exceed 24 in. OC. Studs attached to the floor and ceiling runners with 1/2 in. long Type S12 pan head or 58 in. long Type S-12 low profile head, self-drilling, self-tapping steel screws on both sides of the studs. 3. 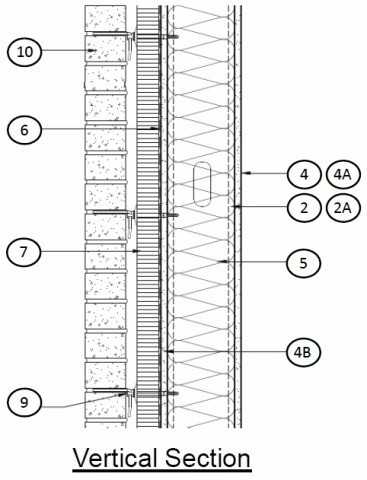 Lateral Support Members — For Bearing Walls — (Not Shown)—Where required for lateral support of studs, support may be provided by means of steel straps, channels or other similar means as specified in the design of a particular steel stud wall system. 4. Gypsum Board* — For Nonbearing Walls — Any 5/8 in. thick UL Classified Gypsum Board that is eligible for use in Design No. G512. Nom. 5/8 in. thick, 4 ft wide applied vertically with joints centered over studs. Fastened to the steel studs with 1 in. long Type S self-drilling, self-tapping steel screws spaced 8 in. OC along the edges and 12 in. OC in the field of the board. See Gypsum Board* Category (CKNX) for list of manufacturers. 4A. Gypsum Board* — For Bearing Walls — Any 5/8 in. thick UL Classified Gypsum Board that is eligible for use in Design Nos. L501, G512 or U305. Nom 5/8 in. thick, 4 ft wide. Gypsum board applied vertically with joints centered over studs. Fastened to the steel studs with a 1 in. long Type S self-drilling, self-tapping steel screws spaced 8 in. OC along the edges and 12 in. OC in the field of the board. See Gypsum Board* Category (CKNX) for list of manufacturers. 4B. Gypsum Board* — For Bearing or Nonbearing Walls — Any 5/8 in. thick UL Classified exterior Gypsum Board that is eligible for use in Design Nos. L501, G512 or U305. Nom 5/8 in. thick, 4 ft wide. Gypsum board applied vertically with joints centered over studs. Fastened to the steel studs with a 1 in. long Type S self-drilling, self-tapping steel screws spaced 8 in. OC along the edges and 12 in. OC in the field of the board. See Gypsum Board* Category (CKNX) for list of manufacturers. 4C. Gypsum Board* — For Bearing Walls — (As an alternate to Item 4A) — Nominal 5/8 in. thick, 4 ft wide panels, secured as described in Item 4A. 4D. Wall and Partition Facings and Accessories* — For Bearing Walls — (As an alternate to Item 4A) — Nominal 5/8 in. thick, 4 ft wide panels, secured as described in Item 4A. 4E. Gypsum Board* — For Bearing Walls — (As an alternate to 5/8 in. in Item 4A) - 2 layers nom. 5/16 in. thick gypsum panels applied vertically. Horizontal joints on the same side need not be staggered. Inner layer attached with fasteners, as described in item 4A, spaced 24 in. OC. Outer layer attached per Item 4A. 5. Batts and Blankets* — Foil or unfaced glass fiber batts, min 3-1/2 in. thick, having a min density of 0.8 pcf, , placed to fill the interior of the stud cavities. OWENS CORNING — Types EcoTouch Fiber Glass Insulation (unfaced) or EcoTouch Flame Spread 25 (faced). 5A. Curtain-wall Insulation * — (XHGU) - as an alternate to Item 5 - Foil or unfaced mineral wool batts and blankets, 3-1/2 in. thick min, placed to fill the interior of the stud cavities. THERMAFIBER INC — Types FireSpan 40 or FireSpan 90. 6. Exterior Wall System Component* — (FWFX) — Combustible Air and Weather Barrier Sealant- — Applied to completely cover the gypsum sheathing at a min thickness of 35 mil (0.9 mm) dry, 70 mil (1.8 mm) wet thickness. 7. Foamed Plastic* — Unfaced max 4 in. thick applied to studs with Type S-12 ceramic coated self-drilling steel screws of sufficient length spaced 12 in. OC with 2 in. diameter plastic pronged continuous insulation washers. 8. Mortar Dropping Protection — (Not shown) - 10 in. high, at bottom of air space on top of through wall flashing assembly, 90% open weave drainage mesh adjacent to weep vents. Thickness to fill air space cavity between foam insulation and exterior brick. 9. Masonry Veneer Anchor — Zinc barrel screw masonry veneer anchors with 1 in. long self- drilling tip attached into steel studs. Includes flanged head/integral zinc/EPDM washer, and themal break clip to receive pintle wire tie. Installed on each stud 16 in. vertically with 2 in. diameter plastic brick tie washers. 10. Brick Veneer — Any 4 in. wide brick. Min 1 in. air space provided between veneer and foamed plastic. 11. Joint Tape and Compound — Vinyl or casein, dry or premixed joint compound applied to interior face in two coats to joints and screw heads. Paper tape, 2 in. wide, embedded in first layer of compound over all joints. Optional on exterior face.